This post is sponsored by the National Mango Board. All thoughts are my own. What do you do with a child who is curious about new foods? Embrace it of course! My little one has shown interest in trying new foods, so I brought in one of the sweetest tastes of summer. Mangos! 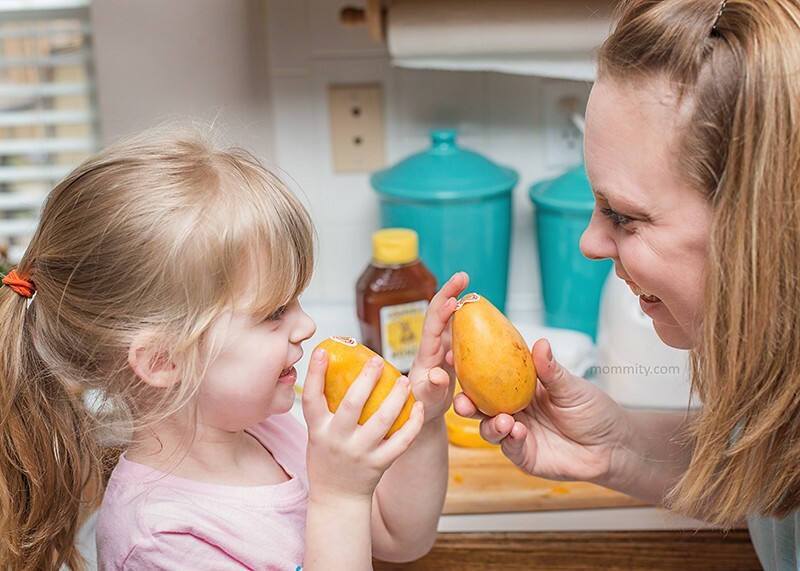 I brought a bunch of mangos home from the store and talked about them with my little girl. We held the mangos, squeezed them, smelled them and talked about how to prepare them. Don’t judge a mango by its color – red does not mean ripe. 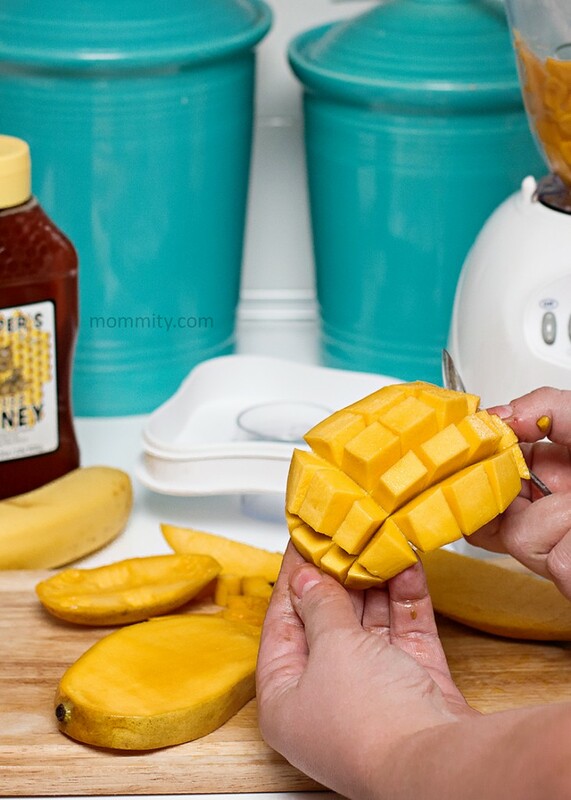 To find a ripe mango, just squeeze gently. A ripe mango will be slightly soft like a peach or avocado. A firm mango will ripen at room temperature over a few days. Since I was kind of new to the mango world too, we went to the experts. This is what I learned..
To cut a mango, simply slice off the sides of the fruit, avoiding the large seed in the center. Once you have these two sides, you can get to the flesh and slice or dice as needed. Then, simply scoop it out of the skin. For more on how to cut a mango or delicious new recipes, visit Mango.org. We went to cutting and scooping of the mangos, tasted them and talked about some of the mango qualities. 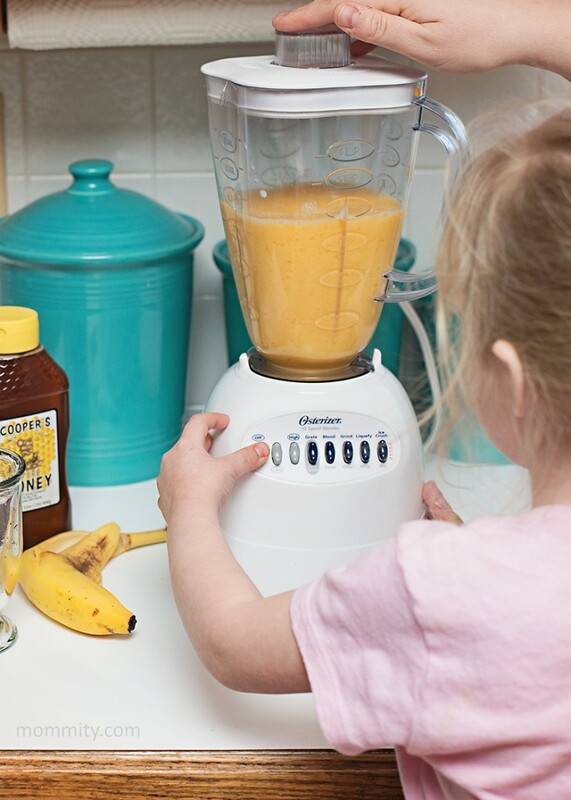 For this mama, it is refreshing to know that mangos are only 100 calories per cup, provide 100% of your daily vitamin C, 35% of your daily vitamin A and 12% of your daily fiber. They are perfect to enjoy by themselves as a snack or in a delicious recipe! While on the mango.org website, we decided to recreate the most perfect mango banana smoothie. It really hit the spot on a warm Spring day! My little girl has a fascination with using the blender, so this was right up her alley. How much easier could this get? 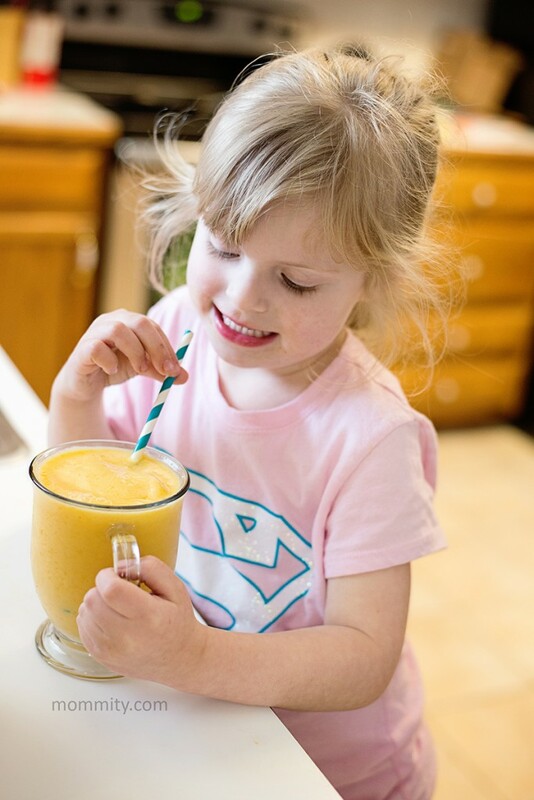 This is the pickiest eater in the world and she now adores mango banana smoothies. We all loved it! 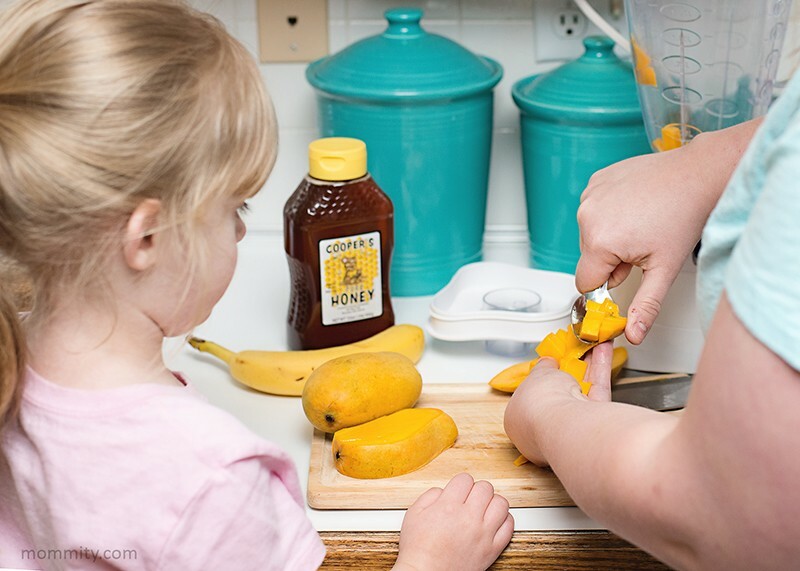 This mango banana recipe is perfect to do with your kids, use it as a cooking lesson! My little girl loved learning about how to cut them, pick them out and putting the recipe all together. With the exception of the knife, this is something that kids can almost do by themselves! 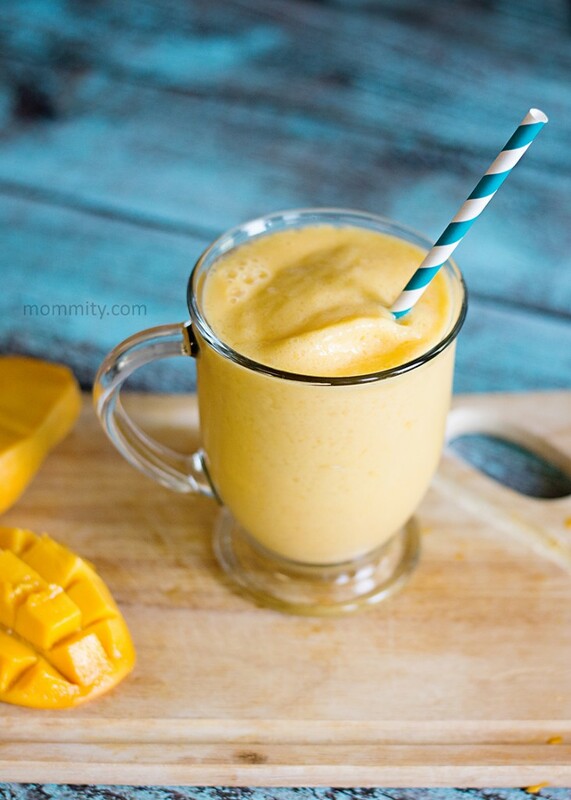 Now that we are big fans of the mango, here are a few other recipes that we are excited to try. Visit www.mango.org for additional information on mango varieties, availability and recipes. ← Help the Environment & Be a Backyard Superhero!